The term 'charter' refers to a free public school operated independently of the local school board, often with a curriculum and educational philosophy different from the other schools in the district. Charter schools are held to the same accountability standards of the state testing system as all public schools. In our state, any child living in the commonwealth of Pennsylvania may attend our charter school. Montessori is simply a way of teaching that was originated by Maria Montessori in the early 1900’s. The Montessori method is hands-on, self-paced, and child centered. It has been proven so successful that countries all over the world use this method. It is not related to any religious group, but encourages the child to develop peaceful ways of living. Who can enroll in the school? Children in grades K-6 who are Pennsylvania residents. 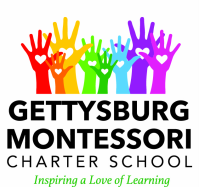 How did the Gettysburg Montessori Charter School come about? In 2005, a small private Montessori school was opened in Gettysburg called the Children’s Montessori School of Gettysburg offering education to children age 3 to 6. In 5 years, that school grew to offer private education Pre-K to 3rd grade. Due to the growing interest for Montessori education in Gettysburg, a group of dedicated parents gathered to create a charter school. In November 2009, an application was submitted to the Gettysburg Area School District chartering our school and allowing it to be free to anyone. Who has attended a Montessori School?